Having over 29 years of experience working professionally with horses and riders, my love of, and passion for, the health and well-being of all horses has been the driving force of my life. I feel it an honor to be near a horse. I am a former jockey, licensed racehorse trainer, and handicap analyst television personality. Currently I focus on Performance Sports Horses and Equine Therapy. 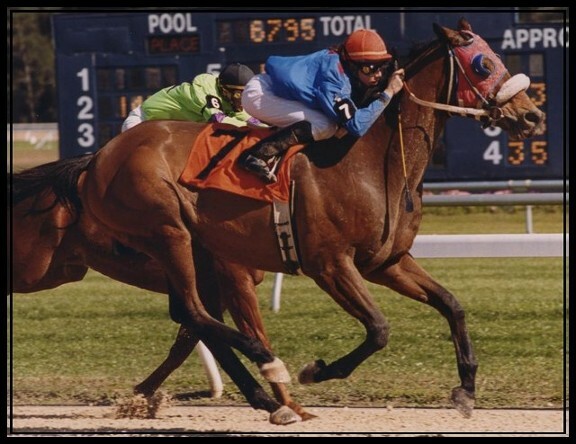 My eighth traumatic spinal injury happened while breaking out of the starting gate at Tampa Bay Downs in February of 2000, causing extensive damage to my spine: a loss of more than two inches of height due to disc herniations and fractures. With the gracious assistance of numerous talented, caring, and generous practitioners, I slowly regained function. After four years of prayer, chiropractic, physical therapy, surgery, massage therapy, acupuncture, and Prolo-therapy, I could even ride a horse again! Dr. George Kollias, D.C. Tampa, FL; Jockey Mike Smith, who enabled me to become a patient of the world renown surgeon, Dr. Alan Carl; Orthopedic Specialist Dr. Alan Carl, responsible for the fusion on my spine; The Don MacBeth Jockey Fund for their financial assistance; Chiropractor, Dr. Alan Maynard for restoring my body to function, week after week; Dr. Troy Thompson, my family doctor, for his insight into pain management, Dr. Brad Sandler, for his prolo-therapy, Dr. Charlene Xang, for her authentic acupuncture, Larry Britton for his gift of countless massage therapy sessions, and my horses and dogs for helping to heal my soul. Understanding how a body heals, from the point of view of the patient, was a profound learning and spiritual experience. Out of this experience, my love of the healing arts was born, and my career took a new turn: Equine Therapy. I was already keenly aware of the potential frailty of the equine athlete from my years spent on the Thoroughbred racetracks. The privilege of riding such great horses as Perfect Sting; Horse of the Year 2001, and other Breeders Cup and Kentucky Derby contenders, was influential in my appreciation of the horse as a powerful, yet fragile athlete. The best known prevention for injury has always been to properly condition the racehorse. Having the honor of working inside the barns of our Nation's best racehorse trainers, I witnessed the transformation supplied by Reiki, acupuncture, massage therapy, and chiropractic. I question the old adage: "Time heals all wounds," and find it to be untrue. Bodies need an interruption of the cycle of dysfunction in order to heal well. Without treatment, a bodies defenses are scarring and calcification. These are limitors to elastic, healthy tissue and usually result in re-injury. Cassandra Snyder & Aladdin's Treasure, a TB gelding owned by Pratt Industries. Aladdin was brought to me after being banned from numerous barns in FL. His undiagnosed sacro-illiac tear was causing him to be extremely aggressive. Aladdin happily returned to performance with better-than-before form, function, and desire. I remember my first experience and memory of the emotion happiness: I was four years old and my family traveled South to visit my Mom's side of the family. I was set upon the back of a grand farm horse named Old Jon as he was led down the steep mountainside at my Great Uncle Clayton's farm in Virginia! It didn't matter that I slid right down his neck and off onto the ground; I had gotten to ride a horse! I shrieked with joy as I tumbled down the hill. I had gotten to ride a horse! Most of my childhood was spent delightfully dreaming of, and wishing for, a horse. "You ask the Lord, and he will give you horses, whenever the time is right." 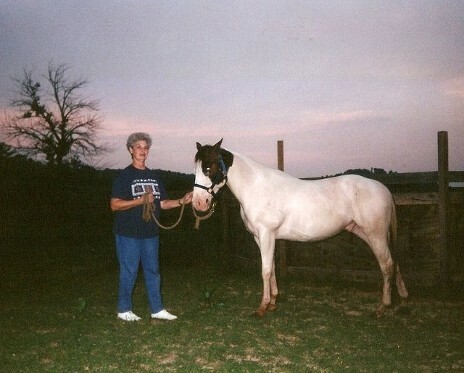 My dear Grandma, Lois Phillips, posing with a horse she arranged for me to be around. "To ask God with all of your heart and continue to believe." Thank you to all those who encouraged me when I was young, and said I had a way with horses. Thank you Peggy Ferguson for picking me up and taking me to 4-H meetings and teaching me how to ride. Thank you Mr.and Mrs. Frank for allowing me to ride and work with your herd of beautiful Arabians. Thank you for exploring this website.